Retired Col. Steve Strobridge, government relations director at Military Officers Association of America (MOAA), was the sole military association witness testifying at a March 21 House Armed Services Military Personnel Subcommittee hearing. MOAA Government Relations Director, Col Steve Strobridge testifies at the House Armed Services Committee hearing on military health programs. Strobridge, who also serves as Co-Chair of The Military Coalition, a consortium of 34 military and veteran associations, told the Subcommittee the Pentagon’s proposals for dramatic fee hikes under the military TRICARE health system constitute a serious breach of faith with the military community. He contrasted these proposals with senior Defense leaders’ earlier commitments not to change the military retirement system for anyone already on active duty. Strobridge sparred in debate with Dr. Jonathan Woodson, assistant secretary of defense for health affairs, who said a Congressional prohibition of TRICARE fee hikes would cause active duty end strength to be cut by 30,000 to 50,000 more troops than planned. The Surgeons General of the Army, Navy and Air Force also testified, but were not asked any questions about the TRICARE health fee increases. 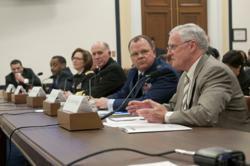 “There are ways to make our defense health system more efficient besides raising healthcare fees,” Strobridge said. He particularly challenged defense and service leaders’ unwillingness to restructure the stove-piped military health care system that includes three separate service systems and multiple contractors that now compete for budget share. Further, he expressed MOAA’s strong objection to the proposal to index TRICARE fees to some measure of health cost growth. “We believe the percentage increase in any year should not exceed the percentage growth in military retired pay,” Strobridge said. Finally, Strobridge aggressively challenged the idea that military retirees should have their fees raised because they pay less for health care than civilians do.